Limiting inrush current at the primary of transformers has always been a problem. Depending generally on the transformer type, quality and the voltage phase angle at start-up, the inrush current can be 15-20x nominal rated current for a short period of time. This can cause an issue concerning adequate protection of the transformer primary. The protective device should be rated sufficiently to protect the transformer, but not so high as to trip upon start-up. Some standards, for example, EN61558-2-15, require that a transformer be energised 20 times, with 10 second intervals and that the inrush should be within accepted limits. This means that conventional protection must be overrated to such a degree as to affect performance, or that time-lag devices should be used, again potentially affecting protection performance. We have solved these sorts of problems in several ways. 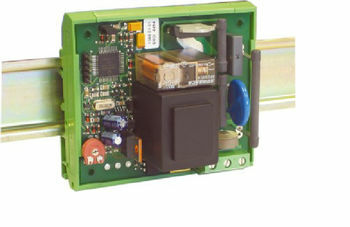 - NTC components on the input side are often used as a low cost solution. However, their drawback is the reset time can be quite long. For example with our standard REOMED units we say that the unit should not be re-energised for 60 secs to ensure that there is no fuse failure. Of course, we can offer the REOMED with more sophisticated inrush protection if required. Some customers use battery back-up systems on these NTC protected units and that has caused problems in the past, when the units change from mains to UPS. The power is effectively disconnected and this is enough time for the REOMED to demagnetise slightly causing an inrush and some nuisance tripping. The problem was solved by taking a slightly larger fuse ut could have also been solved by one our more sophisticated options. As well as integral inrush protection on our own products, REO offer modular systems which can be DIN rail mounted for easy integration into any equipment, so comprimising protection is not the only option.